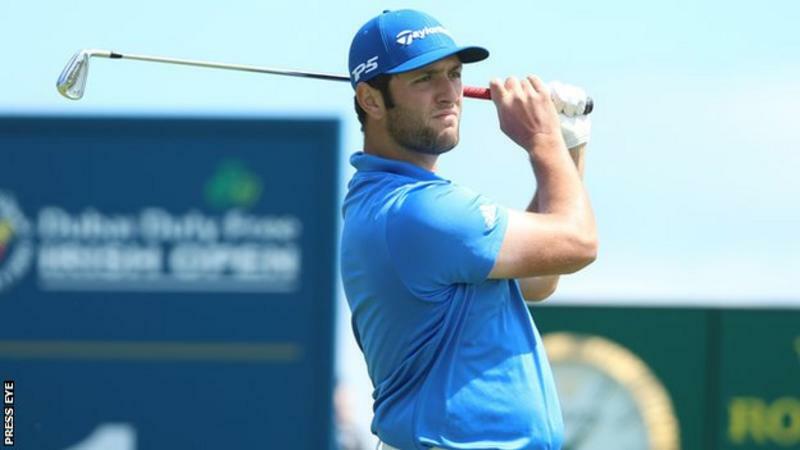 Jon Rahm and Daniel Im are tied for the lead at the Dubai Duty Free Irish Open, both having tied the record 54-hole score of -17. While Im is an American and I am therefore quite interested in how he does, the fact remains that Rahm is the big story at this point. Im is 32 years old and 542 in the world rankings, while Rahm is still fresh out of college and ranked 11th. This would be Rahm's second worldwide win this year. Don't think for a moment that these two have dominated the tournament -- far from it. While Rory missed the cut because everybody who made the cut was under par, the leaderboard is bunched going into the final round. There are 11 players (including Justin Rose) within five shots of the lead, and seven more just another shot back, with Tommy Fleetwood in that group. Rahm and Im are a mere one shot clear of third place. With the BBC predicting light rain, light winds and cool temperatures around 13°C (about 56°F), I'm not sure anybody can just run away and hide today. For example, neither Rose nor Hideto Tanihara have made more than two bogeys this week and both are close to the lead (Rose is four back, Tanihara two). And Rose has two eagles as well. This could be a very interesting final round. Remember, GC has coverage starting at 7:30am ET.